OLD PARKED CARS. 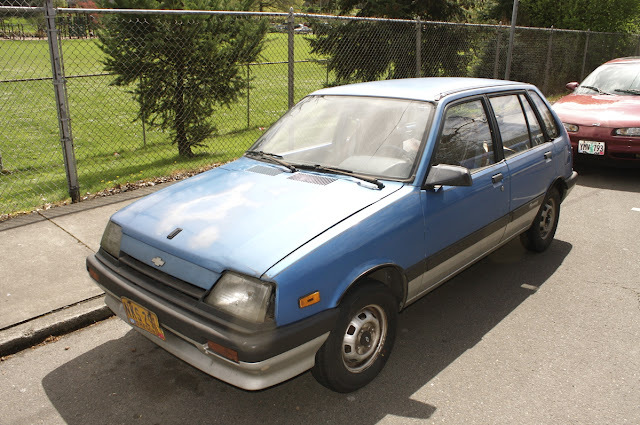 : 1987 Chevrolet Sprint 5-Door Hatchback. 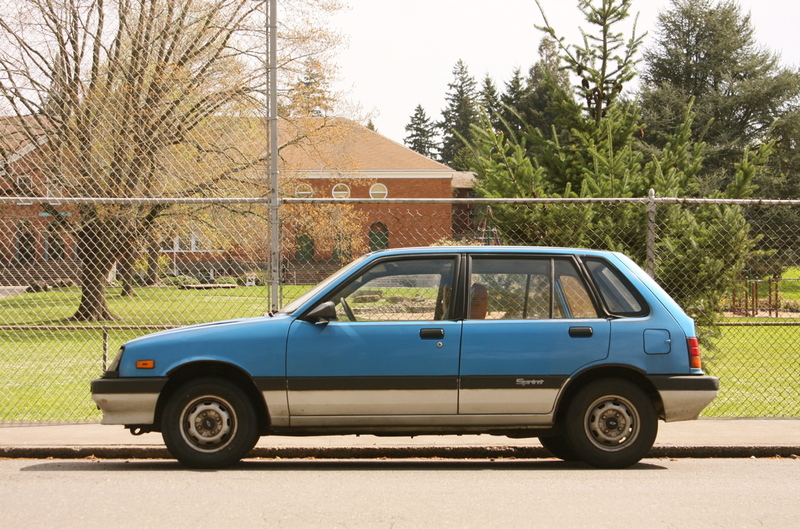 1987 Chevrolet Sprint 5-Door Hatchback. Calling this a wagon cracks me up. It's a very optimistic label! 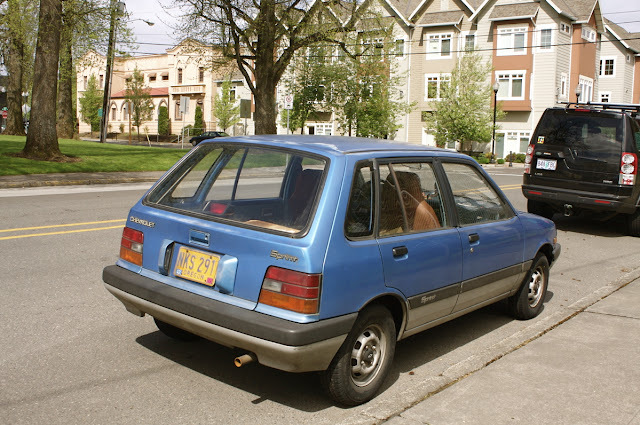 The idea that this car is now 25 years old, which, if memory serves me correctly is the first crude rule-of-thumb for classifying a car as an "antique", just blows my mind. Where did the time go? How are these cars surviving? Why do they still look "contemporary" to me? Why do they not look terribly dated, just a little bit dated? Nice work - OPC. This is one of my favorite pages to visit. Did Chevy really refer to this as a "wagon?" Seems like a real stretch....it appears to be more of a 5-door hatch! you'd think that the standard catalog of american cars 1976-1999, which is sitting here on my desk, would have the answer to that question. but you'd be wrong, because it doesn't acknowledge the existence of the sprint, which was a rebadged suzuki. anyway, wikipedia calls it a 5-door hatch, and so do you guys, so that is what it is, and i am happy about it. Nice rare find. This should have been a toaster sitting on a wal-mart shelf by now. My second favorite car. Predecessor to the venerable Geo Metro. Perfect! it looks like a pill. Probably on purpose too. Had a 2 door, silver, 5 speed as my first car. The guy had removed the radio so I put a CB in its place. Was able to get 47 mpg on highway trips. I bought it for $350, bought a tailight for $15 from a guy who was obsessed with them (he had a whole collection of Sprints outside Cmabridge, Ohio) drove it for a few months, then sold it for $700! This blue 5 door is in good shape: Oregon must've done it well because they fall apart eventually in Ohio! Sprints hold a special place in my heart to this day.